Haotong Li's reputation continues to soar after second place in Saudi. 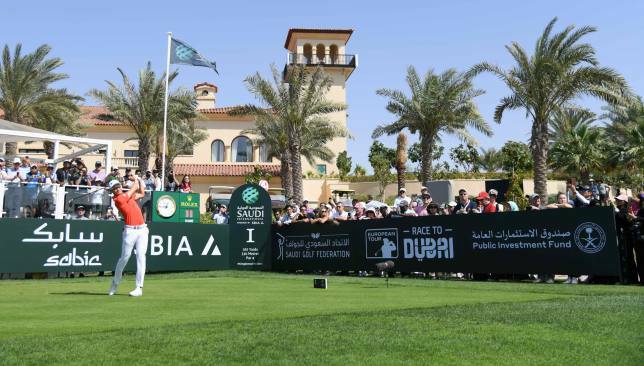 The inaugural Saudi International powered by SBIA saw several players making strong strides in the Race to Dubai with Haotong Li chief among them. The rising Chinese star finished runner-up to Dustin Johnson in the historic event at Royal Greens Golf and Country Club. While American Johnson put in a silky display, which included a second round 61, to take the €508,260 winner’s cheque after a captivating final round duel with playing partner Li, the 23-year-old put the disappointment of a late rules infringement penalty at last week’s Omega Dubai Desert Classic behind him to finish two strokes back at 17 under par. That saw him claim 472 Race to Dubai points in the process to move 68 places from 77th to ninth place in the European Tour’s season-long rankings. Having entered the final round tied for the lead at 16 under par, there was little to separate the pair over the front nine. Two-time European Tour winner Li got his nose in front with a birdie on nine but Johnson hit back with consecutive birdies on 11 and 12. 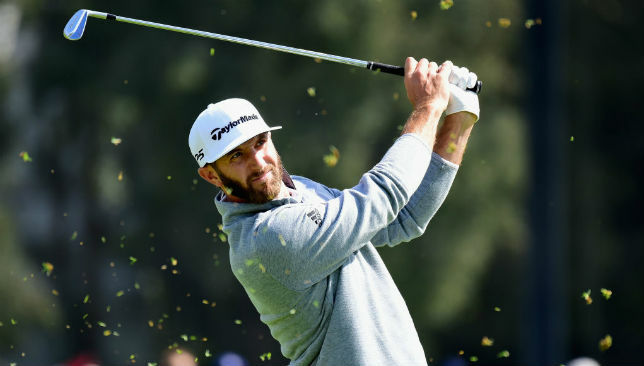 Dustin Johnson has started well in 2019. Li’s chance looked to have gone when he dropped shots on the 13th and 14th before Johnson opened the door again with a bogey on 16. But the 2016 US Open champion showed his class with a birdie-birdie finish over the final two holes while Li served further notice of his world-beating potential by calmly rolling in a five foot birdie putt at the last to secure solo second place. “I think he deserved to win this event,” said Li who had been docked two strokes on the final hole at Emirates Golf Club last week for breaking one of the game’s new rules which says a caddie cannot stand behind a player when he lines up to take a putt – the penalty saw Li drop from tied third to tied 12th. England’s Tom Lewis produced a blistering final round of 65 which began with five birdies in a row to take third place on 16 under par, claiming 266 points to move from 30th to 11th in the Race to Dubai as the Kingdom hosted its first ever professional golf event. “I was happy with that,” said the two-time European Tour winner. “We did really well, me and (caddie) John, working out some numbers. I was able to hole the putts and I couldn’t have asked for a better start. Unfortunately, I didn’t kick on from there. 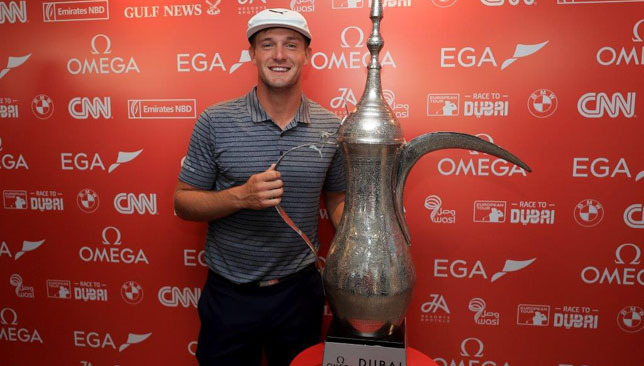 Bryson DeChambeau won the Dubai Desert Classic. Australia’s Min Woo Lee entered the Race to Dubai in 28th position after taking fourth place at 15 under par in his first event of the season while France’s Alexander Levy made a huge leap from 161st to 30th after finishing one stroke back in fifth. Dubai Desert Classic winner Bryson DeChambeau put in another solid display to share sixth place with Ryan Fox, Ian Poulter and Scott Hend at 11 under. The American moves from fourth place to third in the rankings while New Zealand’s Fox leaps from 72nd to 34th, Australian Hend progresses from 33rd to 25th, and Englishman Poulter solidifies 10th position. The top 60 players in the Race to Dubai rankings will contest the season-ending DP World Tour Championship at Jumeirah Golf Estates in Dubai from November 21-24. 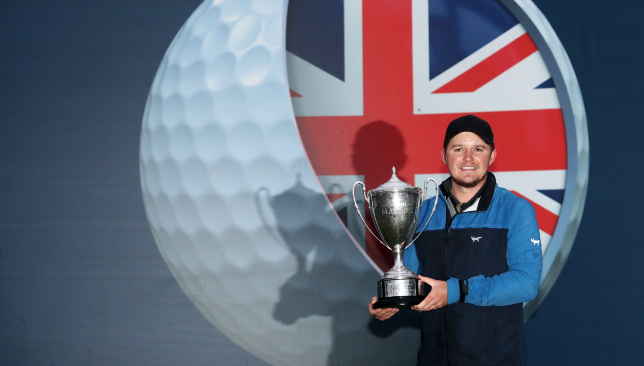 Eddie Pepperell defied miserable conditions with a little help from his mum to win his second European Tour title of the season in the British Masters – and with it a different Masters appearance next April. Pepperell carded a closing 72 at a wet and windy Walton Heath to complete a wire-to-wire victory on nine under par, two shots ahead of playing partner Alexander Bjork from Sweden. Australian Lucas Herbert and England’s Jordan Smith finished two shots further back, with tournament host Justin Rose carding a closing 70 to finish eighth on three under and Ryder Cup team-mate Tommy Fleetwood another stroke behind. Pepperell’s three-shot overnight lead was down to a single stroke when he three-putted the ninth – the same hole where he enjoyed a spectacular hole-in-one on Thursday – and Bjork covered the front nine in 34. However, Pepperell then promptly holed his second shot to the 10th from 122 yards for an eagle to move three clear and, although bogeys on the 15th and 16th set up a nervous finish, the 27-year-old from Oxfordshire saved par from a bunker on the last to seal a deserved win. “The credit for the eagle goes to my mum Marian because she gave me some mittens as I was walking off the 10th tee,” Pepperell joked. “It was such a tough day in the conditions, I didn’t swing it well from the get-go and it was an absolute grind. “I did not sleep great the last two nights. My mind was very active, especially with all the stuff after the hole-in-one, the social media. “It was hard to keep my mind on the golf because I was leading all week, I didn’t do much practice and I played terrible leading up to the event; Wednesday was the worst I’ve played for ages. The win will take Pepperell into the world’s top 35 and almost certainly secure a Masters debut in 2019, with the top 50 at the end of December qualifying for the first major of the year at Augusta National in April. Pepperell was ranked outside the top 500 as recently as May last year, but won the Qatar Masters in February and followed a runners-up finish in the Scottish Open with a tie for sixth in the Open seven days later, carding a closing 67 at Carnoustie despite being hungover. “It’s always been a dream to play in the Masters and it’s been my caddie Mick’s goal to get me into the top 50,” Pepperell added. “It also shows I’m not a one-hit wonder and I’m actually really pleased for my mum and dad to see it because they weren’t in Qatar. For them to be here is pretty awesome. “I’m interested to see how different Augusta is to what it appears on TV and there’s going to be some nice events for me to look forward to next year. It’s going to be a great opportunity for me to go to America and play a few more majors and WGCs (World Golf Championship events) obviously. Molinari – who was tied 56th – still enjoys a lead of more than 1.3million points with five events remaining. Andrea Pavan of Italy celebrates victory at the D+D REAL Czech Masters. Italy’s Andrea Pavan produced a blistering back nine of 31 at the Albatross Golf Resort to sign for 67 and a tournament record 22 under par to win the D + D Real Czech Masters by two strokes. 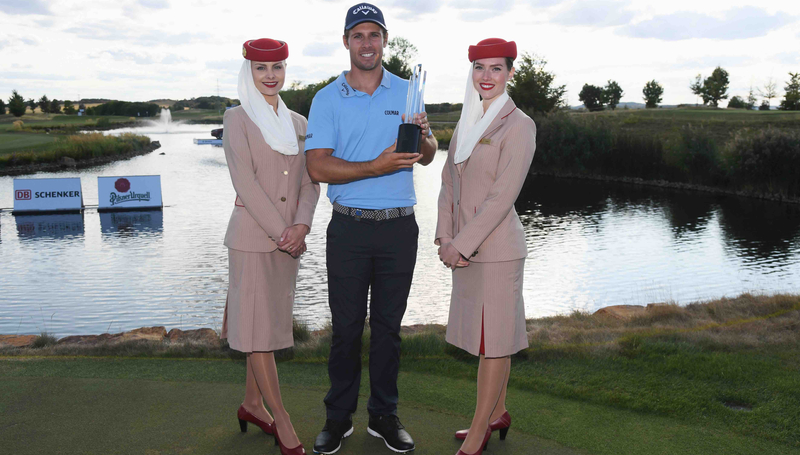 Pavan, 29, ousted three-time major champion Padraig Harrington in Prague as he claimed his maiden title by two strokes and all but sealed a maiden berth in the season-ending DP World Tour Championship in Dubai in the process. The former Challenge Tour player, who topped the Rankings in 2013 and is familiar with Dubai having finished tied fourth at the Challenge Tour Grand Final at Al Badia Golf Club that year, looks set for a spot in the field at Jumeirah Golf Estates in November. The tournament is open only to the top 60 players and Pavan took a step towards appearing after claiming 195,830 points to move from 53rd place to 39th in the European Tour’s Race to Dubai rankings. Pavan, who played back on the Challenge Tour last season before regaining his European Tour card at Qualifying School, said: “It’s amazing, it’s massive. I’ve won four times on the Challenge Tour but it was a long time ago,” said the Rome native. “I’ll enjoy this one because it’s really hard to get and I’ll just keep working on the stuff that seems to be working and enjoy the success. 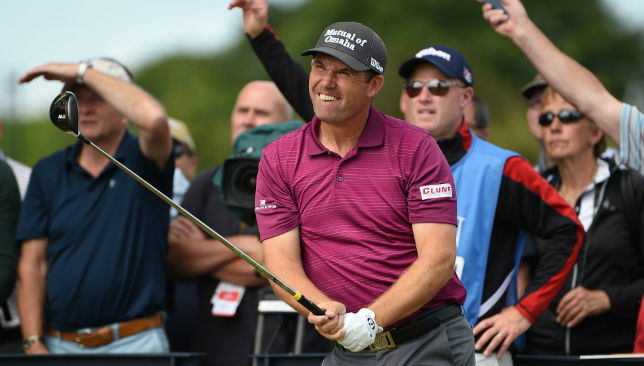 Padraig Harrington lost out in Prague. “Andrea is a great example of a player learning his trade on the Challenge Tour before going on to show his class on the European Tour,” said Nick Tarratt, Director European Tour International Dubai Office. Harrington and Pavan were tied for the lead heading into the final round and the esteemed Irishman looked to be on his way to his 16th European Tour title when he led by three at the turn, but a back nine of 36 saw him sign for 69 to finish two strokes back from his emphatic playing partner. The Ryder Cup vice captain gained 130,550 points to move from 204th to 143rd in the Race to Dubai while Malaysia’s Gavin Green took third place alone for 73,555 points which moves him from 99th to 80th. England’s Lee Slattery is on the precipice of a third DP World Tour Championship appearance – and first since 2015 – with a solid closing round of 68 to share fourth place with Scotland’s Scott Jamieson at 15 under par. The pair each gained 54,285 points which sees Slattery move from 50th to 45th in the Race to Dubai while Jamieson improves his position from 128th to 120th. The top three in the Race to Dubai remains unchanged with Italy’s Francesco Molinari leading the way on 4,635,909 points, the USA’s Patrick Reed in second place and reigning Race to Dubai champion, England’s Tommy Fleetwood, in third place.